On its 25th anniversary, the School of Music took the opportunity to inaugurate its new facilities. This video traces the history of the School of Music and presents in pictures its new premises, new halls and new studios. New studios for which Go multimedia has created the geometric form and acoustic design. We are pleased to learn that the “Les Grands Moulins de Villancourt” project, the subject of the architectural competition won by the architectural firm Cardin Julien in collaboration with ARCANE Architectes and Go multimedia, is finally coming to life. You can, by consulting the link below, find the images of the competition on the website of the architecture firm Cardin Julien. We are proud, for the three projects mentioned below, to have been part of the prize-winning teams of the 12th edition of the Grands Prix du Design. Teams for which we have contributed our expertise and know-how. Our unparalleled sensitivity and technical experience in heritage spaces transformed into production spaces have enabled us to be chosen as scenographer to assist the winner of the architectural competition for a neat and effective integration into this existing cultural space. Virtual tour of Théâtre Gilles-Vigneault in St-Jérôme, which has been open to the public since the November. Go multimedia is mandated by the city of Repentigny to design a Hybrid theatre in the new Espace culturel to come. It will allow the holding of amplified popular shows, corporate events with reception tables, musical productions in cabaret format but also classical music concerts. This venue will be the only one of its kind in Canada. Keep yours ears open!! Our involvement as a scenographic and multimedia expert for the construction of the new Colisée de Trois-Rivières was to establish the technical prescriptions and parameters necessary for the writing of the technical specifications used in the call for tenders and to ensure that the requirements established in the program were respected during construction. The amphitheatre will have two LED rings around the rink and a technical ceiling that can accommodate the performance infrastructure. The new Coliseum should be ready by the end of 2019 and will be located in District 55. 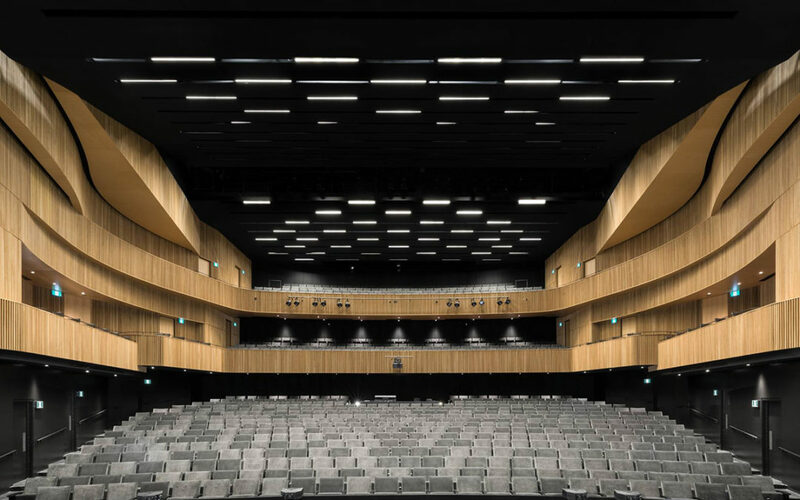 Visit in drone of the new theatre of the city of St-Jérôme, the Gilles-Vigneault Theatre, in which we participated during its construction for the whole stage and multimedia part. Credit : Construction Demathieu & Bard Inc. Mandated to create an interactive multimedia environment as the new modern and collaborative spaces suggest.